It was fun and messy!!! and some wasted frosting sheets!!!!! 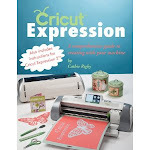 My BFF Abby invited me over so that we can decorate our first cake using the Cricut Cake together! This is the end result! Abby brushed brandi! yes, brandi so it becomes shiny and you see no white powder! We discovered that the fondant cuts beautifuly, but not the frosting sheets.... or was it that larger size cuts such as the 2" edge you see cut beautifuly with fondant, but when we tried cutting a "happy birthday" layered sign/sentiment, it ruined the frosting sheets... it would cut nice going one way, but as soon as the Cricut Cake came back to cut the rest of the sign/sentiment it would pull the frosting sheet and mess up the whole thing. I think we tried 3 times before giving up and just cut RINA in bigger letters! !